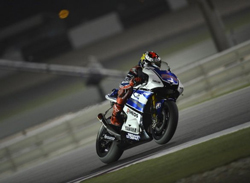 Spain’s Jorge Lorenzo halted world champion Casey Stoner’s Grand Prix of Qatar surge when he clocked the fastest time in Friday’s second and final practice ahead of today’s floodlit season-opener. The Yamaha rider, the world champion in 2010, had been second best to the Australian Honda star in Thursday’s session and Friday’s first stretch, but then clocked a lightning 1:55.302 lap, just outside Stoner’s 2008 circuit record. Britain’s Cal Crutchlow, on another Yamaha, was second quickest, 0.154sec behind with Stoner relegated to third spot, 0.372sec off Lorenzo’s pace. “I am very happy because we improved a lot on lap time. I’m also happy for Cal in second, the bike seems much better than last year for us,” said Lorenzo. Spain’s Dani Pedrosa, on another Honda, had also come to grief in the first session although he was able to record the fifth best time later in the evening behind Andrea Dovizioso on a Yamaha in fifth. The best Ducati performance was a sixth place by Hector Barbera riding for the Pramac satellite team with the Spaniard putting factory riders Nicky Hayden and seven-time MotoGP champion Valentino Rossi in the shade. They were seventh and eighth respectively. MotoGP: 1. Jorge Lorenzo (Spa/Yamaha) 1:55.302m; 2. Cal Crutchlow (Bri/Yamaha) at 0.154; 3. Casey Stoner (Aus/Honda) 0.372; 4. Andrea Dovizioso (Ita/Yamaha) 0.603; 5. Dani Pedrosa (Spa/Honda) 0.812. Moto2: 1. Thomas Luthi (Swi/Suter) 2:00.479; 2. Pol Espargaro (Spa/Kalex) 0.040; 3. Esteve Rabat (Spa/Kalex) 0.639; 4. Scott Redding (Bri/Kalex) 0.751; 5. Claudio Corti (Ita/Kalex).